The purchase of your home is one of the largest investments you may ever make and to learn that small little insects (termites) have been damaging your home, will probably be one of the most terrifying discoveries yet. Therefore, as a homeowner, it is important for you to take the necessary steps to protect your home from these relentless creatures. A good place to start is to educate yourself on the options available. This resource will help you distinguish between termite treatments and termite baiting systems. Termite treatments that involve non-repellent termiticides are the most effective way to control termite populations up to six times faster than baiting systems. And unlike other liquids, they do not repel termites—termites can't smell, see or feel the insecticide— so they crawl freely through treated areas. When a termite eats or even comes into contact with the insecticide, it unknowingly transfers the product back to the colony on its body. Every termite it contacts will transfer the product to other termites. Non-repellent products are the only product that will consistently control up to 100% of termites within three months or less—up to six times faster than bait or monitoring systems. Bait can take as long as several years to control a colony. This is because most bait systems work by “recruitment” in which termites must first discover a bait station and then recruit sufficient colony members to it as well. Only then is the termite bait added to the station. Plus, there is no guarantee that the termites will find the bait stations at all. Non-repellent products start working immediately, provides structural protection and up to 100% control in three months or less. That's up to 6 times faster than any bait system! When your home is treated with non-repellent product, a "Treated Zone" is established around the home. This is done using proven, time-tested techniques that the team at Dawson’s Australia are very knowledgeable and familiar with. This "Non-Repellent Treatment Zone" starts working immediately. When a Bait/Monitoring System is installed around your home, you have monitors placed every 2 to 3 metres around the house. On most systems, there is no active ingredient used at first. That means that you have nothing protecting your biggest investment. At this point, all you have is plastic and wood installed around your home every 2 to 3 metres. Bait will not be added until there is termite activity in one or more of the stations. Yes, termites will still be damaging your home until the bait system feeds them enough bait, which can take months or years. Most bait systems work by recruitment. This means that termites eat the bait and return to the colony to recruit others to eat the bait. An above ground bait station with a growth regulator is placed on live termite activity that is identified and located upon inspection of the home. Insect growth regulators work on the moulting process. In Victoria, this normally occurs between October to February. Termites wander into the treated zone and pick up the non-repellent product on their bodies. Termites are a social insect and clean each other. Already, some are "carriers" that are beginning to "infect" others in the colony. The product has been transferred to several termites in the colony. As a result, a number of these creatures will have been exterminated, but the "Transfer Effect" continues to affect termites who have not gone into the "Treated Zone." Still, there may be no activity in the stations - Just termites continuing to destroy your home. 100% Control! No more termites to damage your home. And the non-repellent product is still in the soil around your home, providing protection against any new invading termite colonies. Termites may or may not have found the monitors at this point. However, unless there is sufficient termite activity in the bait monitoring station, the Pest Control operator still might not apply any bait material. Even if there is sufficient termite activity to warrant applying bait to the station, termites are more than likely, still feasting on your home. 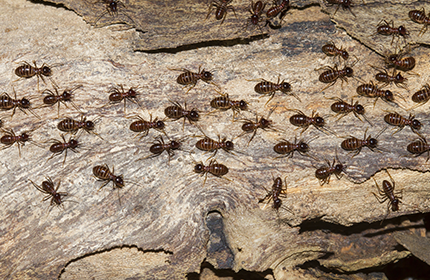 Trust the pest professionals at Dawson’s Australia to ease your termite anxieties! 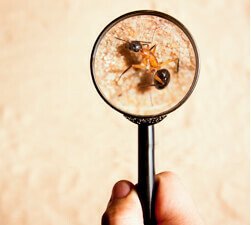 Call us on 03 9222 2266 to arrange a termite inspection.